While I was attending Dalhousie University in Halifax, Nova Scotia, the federal government hosted a gathering with George Bush. The meeting was arranged so Mr. Bush could thank the Canadian people for opening their homes during 9/11. The day was filled with major protests as many students and locals didn’t support the US government’s policies in Iraq and Afghanistan and expressed this, vocally, as the President’s motorcade passed through the streets. My approach to portrait photography is guided by Photographer Robert Cappa’s words: “If your photos aren’t good enough, you are not close enough”. 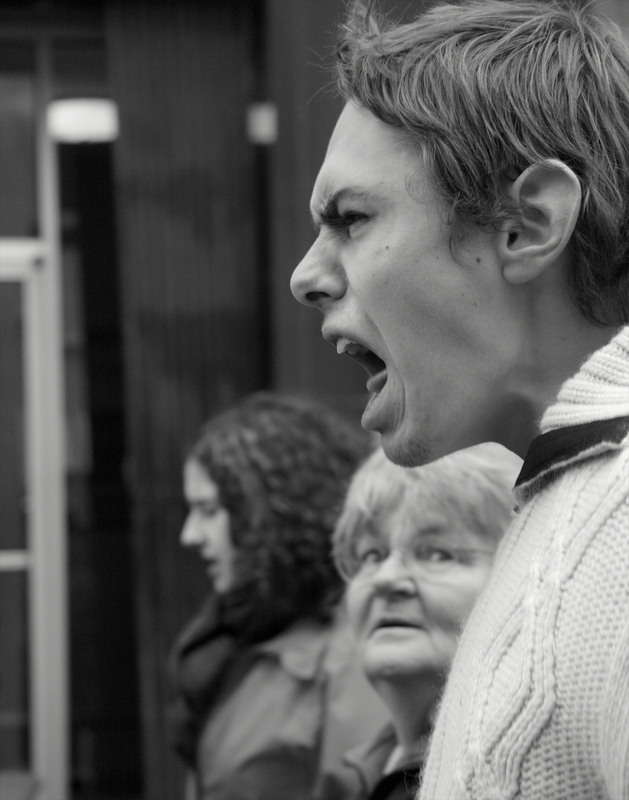 In this shot, an elderly protester peeks up at a student as he screams out one of the many anti­Bush chants.